ASA secretaries regularly report to the membership about the status of ASA’s finances. I do this semiannually by publishing the minutes of the ASA Council meetings at which Council reviews and acts upon the annual operating budget and our invested reserves. I also post the annual audit on the ASA website. The Executive Office publishes an ASA Annual Report just before the August Annual Meeting that contains my financial report, and I present a financial report at the annual Business Meeting. ASA secretaries also periodically report to the membership on our Association’s finances through Footnotes. In these reports we use the most recent ASA financial data that has been audited by an outside auditing firm. For this report, the most recent audited data are for 2014. The 2015 audited data will be available after Council acts on the audit in August 2016. Where does the Association’s income come from? How much revenue is generated? ASA’s total annual operating income for 2014 was $6,408,857. Chart 1 shows the sources of ASA’s total revenues using broad but meaningful categories. Revenue from membership and from the ASA journals are, and have long been, the two largest sources of the Association’s income (33%, 35% respectively), together making up about two-thirds of the Association’s annual revenue. An additional 20 percent of revenues in 2014 came from the Annual Meeting, 6 percent from the sale of other publications, and 6 percent from “other revenues” that included rental income from ASA office space. More detail on these categories follows. What is labeled “Member Revenues” (33% or $2,100,922 in 2014) combines the sources of revenue related directly to ASA membership: membership dues and additional print journal subscriptions purchased by individual members. You will recall that one print journal of your choice is part of your membership dues as is electronic access to all ASA journals (as well as free access to TRAILS as a new 2016 member benefit). The ASA member dues structure was revised by member vote in 2011, effective 2013. This revision was the first change in member dues since 1997 (except for occasional cost of living increases). It was designed to bring the regular member income categories into line with the impact of inflation on members’ salaries over that 14-year period. In addition the Association added a new unemployed member category, while maintaining unchanged member rates for students, retired, and low-income members. Members selecting the highest income membership categories experienced dues increases but there were either small or no increases for middle income groups. 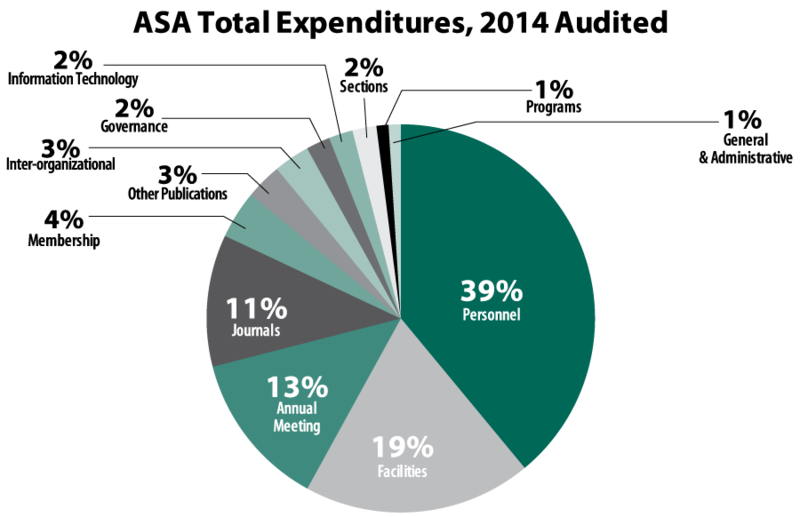 The most significant portion of Journal Revenues (35% or $2,223,042) in 2014 was obtained from annual institutional subscriptions to the ASA journals that are published under a revenue sharing agreement with SAGE. SAGE marketing efforts have significantly expanded the reach of the ASA journals both within the U.S. higher education community and globally. SAGE also provides free institutional subscriptions to ASA journals to colleges and universities in a wide range of low-income countries. A small source of journal revenue in 2014 was annual sales of advertising and reprint permissions fees that are shared with authors. The ASA also received income from other sources classified as “Other Publications Revenue” (6% or $403,893). These sources included such things as listing fees in the Job Bank and ASA Guide to Graduate Departments; advertising in Footnotes; sales of ASA career, teaching, and policy publications; and annual income from the sale of prior years’ ASA journal content available in JSTOR and online. The revenues from the Annual Meeting in 2014 were $1,283,532 or 20 percent of total revenues. The “Other” category of income was $397,468 or 6 percent of total 2014 income. It primarily included the rental of the portion of the ASA headquarters unoccupied by ASA; it also included department affiliate memberships, interest income, ASA fees under research grants, and mailing list rentals. Chart 2 shows the distribution of ASA’s total expenditures for 2014 ($6,501,858). The largest expense for the Association was, of course, our staff, which includes their salaries, group medical, retirement, professional development, unemployment taxes, and temporary help (about $2,562,730) or 39 percent of total expenditures in 2014. ASA has 27 staff in the Executive Office, a number that has remained in the 27-30 range for at least two decades. While the number of staff has remained stable, the positions have changed over time to meet the evolving skill needs of the Association as well as to adjust staffing in relation to the introduction of both technology and the outsourcing of some functions (e.g., ASA computer network and member database). It is important to note that the detailed expenses described below for all programmatic activities of the Association—including journals, publications, programs, and the Annual Meeting—are expenses net of ASA personnel, that is, net of the work done by ASA staff who oversee all areas of the Association’s work. After personnel, the category “Facilities” was the second largest expense category in 2014 ($1,262,461 or 19%). This is a complex expense category because it is contains far more types of expenditures than the cost of the ASA headquarter space. It includes annual depreciation on all the things ASA purchases and amortizes such as IT, other technology, and office equipment. It includes the annual depreciation, amortization, interest and real estate taxes on the headquarters (non-profit organizations in DC are not exempt from real estate taxes whether they rent or own) as well as utilities, fees, repairs and maintenance. It also includes our rental of two ASA off-site storage facilities. Journal expenses in 2014 were $717,088 (11%), primarily the cost of the Association’s support for its 10 editorial offices. (Other expenses for publishing our journals are now paid for by SAGE as part of our contract.) “Other publication” expenses were about $164,758 (3%) (printing and mailing, as well as online publication)representing the production costs of Footnotes, ASA Guide to Graduate Departments in Sociology, ASA Directory of Members, ASA Style Guide; teaching, education, and other ASA publications. Annual Meeting expenses in 2014 were $896,550 (13%). These expenses include large items such as audiovisual equipment for sessions ($318,000), internet communications ($49,000), open receptions with food and open bar ($77,000), employment center ($52,000), the 2014 Program Committee meetings ($43,000), invited program expenses such as travel and lodging for non-sociologist and international speakers ($28,000), the exhibit hall ($31,000), freight ($11,000), child care subsidy ($11,000), as well as the cost of the call for papers ($28,000) and the final program packet ($85,000). Information technology expenses were $225,357 (4%). They included support for the ASA computer network with that includes multiple backup sites for all Association permanent records and fiscal transactions, Internet access, repair and maintenance of equipment. General and administrative expenses at 3 percent of total expenses ($158,000) included all types of insurance ASA must carry (such as those that protect ASA officers and editors if sued). G&A expenses also include ASA’s income taxes (for unrelated business income), telephone costs, and fees for such things as banking, audit and tax return preparation, legal expenses for reviewing contracts and publishing matters, investment and payroll fees. Governance expenses ($145,000 or 2 %) included support of all ASA committees (except the Program Committee), the annual ASA-wide and section elections, and ASA major awards. ASA transfers about two percent of our total annual revenues (from members’ section dues) to the individual sections. 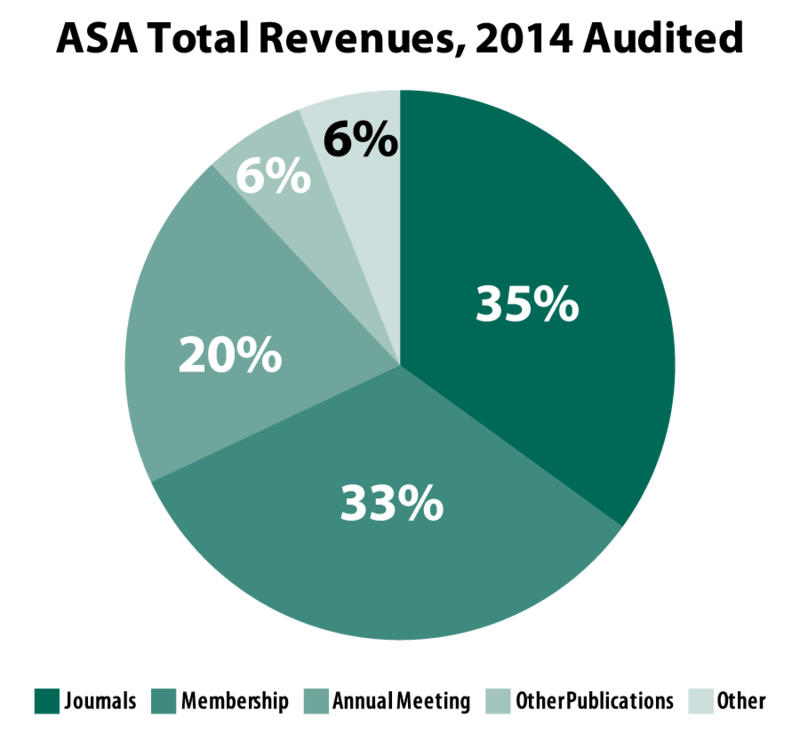 ASA’s inter-organizational expenses (about $79,000 or 1% in 2014) included the costs of the Association participating in the activities of organizations in which ASA is an institutional members, such as the American Association for the Advancement of Science, International Sociological Association, American Council of Learned Societies, Consortium of Social Science Associations, and National Humanities Alliance. ASA has member representatives to these organizations appointed by the ASA President to participate on behalf of ASA. Staff also works collaboratively with them on many types of activities that benefit the profession (including human rights, international scholarship, association management, and advocacy with Congress and federal science agencies on research support for sociology and science policy issues such as the regulation of human subject research). The 2014 budget year ended with a net operating deficit of $93,000 (1.4% of total expenses). This was largely a result of actual revenues being $124,974 below what had been anticipated at the start of the year. Revenue from Member Dues and Member Journals sales were under budget expectations by seven percent ($130,100) and 15 percent ($21,500) respectively. Council’s decision to give access to the electronic copy of all ASA journals to members as a member benefit in 2015 was with the understanding that revenue for additional print subscription purchases would decline to virtually nothing over time; this is happening at a slightly more rapid rate than expected. EOB and Council also viewed the 2014 decline in dues revenue to be within the historical pattern of ASA membership increases and declines. Nonetheless, the elected leadership and staff continue to work vigorously to ensure the Association is responsive to member needs and desires for ASA services and activities. The Association staff kept most expense categories in 2014 at or under budget as a means of limiting the deficit. As of the second quarter of 2015, June 30, 2015, ASA had an investment portfolio of $7,656,975. About 75 percent of the portfolio constitutes ASA’s “reserve” funds ($5,764,307) which are to be used by Council for emergencies or for programmatic investments. The reserve amount was about 86 percent of ASA’s annual operating budget and thus well within the range considered fiscally prudent for non-profit corporations of our size. The remaining $1.9 million in the investment portfolio is distributed among the following funds: the American Sociological Fund, the Spivack Fund, the Rose Fund, the Teaching Enhancement Fund, the Sorokin Fund, and the Congressional Fellowship Fund. Council annually authorizes the use of funds from these accounts. Guided by Council’s investment policy, EOB determines and manages the ASA investment portfolio with the assistance of a professional investment advisor who has worked with the ASA since competitively selected in early 2005. A third of ASA’s investments are in fixed income assets and two-thirds are in equities. The portfolio is widely diversified in asset classes (e.g., U.S. large value stocks, U.S. Small Value stocks, Real Estate, International large company stocks, bond funds, etc. ), and even further diversified because the investments EOB has made in each asset class are in mutual funds that are themselves highly diversified. The investment approach EOB selected is called “passive investing”; that is, the managers of the investment funds in which ASA holds shares do not attempt to predict the market. Rather they rely on broad diversification (guided by substantial academic-based research) to mitigate market fluctuations. EOB invests ASA funds primarily in DFA (Dimensional Fund Advisors) mutual funds, each of which includes a very large proportion of the available stocks in its asset class or of investment grade bonds. EOB initially worked to determine a distribution for ASA investments in various asset classes that would limit the level of risk appropriate for a non-profit membership association such as ASA as well as achieve market growth. EOB has taken a disciplined approach to managing the portfolio in order to maintain this distribution of funds across the asset classes despite market fluctuations. As ASA investments in a particular asset class grow and reach the maximum of the EOB target allocation, EOB sells and then buys in those asset classes that are approaching the minimum proportion of the target range. This disciplined “selling high and buying low” approach has both preserved and grown our portfolio. This investment management strategy especially benefited ASA during the period in which ASA removed the invested assets in our Building Fund ($1,644,277 from the sale of ASA’s previous DC headquarters in the 1990s) to provide the bulk of the $2,000,000 for the down payment on the new ASA headquarters that we purchased in 2007. While this was just before the steep downturn of the stock market in 2008 and the Great Recession, EOB’s investment strategy helped ASA’s portfolio weather these asset declines. By 2014 ASA’s portfolio had returned to pre-recession values and almost to their value prior to ASA taking out the $1.6 million for purchase of the ASA headquarters. In addition to our invested portfolio, ASA also now has a continuing real property asset—the headquarters space it owns in downtown DC. In authorizing this purchase, Council expected that ASA will remain in this space for many years to come. It is a valuable investment sheltering the Association’s home both now and in the future from the ever volatile fluctuations of the rental market and allowing for expansion or contraction of staff.